Well; it’s been one of those weeks. No. Make it – one of those months. Anything that could go wrong, did. Lewis Hamilton will know just what I mean. Usually when I head out I’m a bit lazy. I jump in Bert and drive to the gate. Then jump out to open it. But for some reason I walked down the driveway, slid open the gate, and walked back. “Bert looks a bit strange” I thought to myself. “He looks like he’s down on one knee as though he’s about to propose.” Well, I have noticed he’s had one eye on the neighbor’s Toyota Vios. But really, a Toyota Vios! No taste some people. Anyhoo, sure enough, he was down on one knee … another left front puncture! I think I should return to the local wat and complain to the monk who blessed him. When he was splashing his holy water around, he must have missed a bit. But, I fear “Would you mind sprinkling on my wheel” might get lost in translation. See! Too much posing and not enough sprinkling! At least this time it wasn’t a sudden blood-pressure-inducing blow out. I hadn’t driven on the flat, so the wheel was not damaged. And being at home made life easier. I could pull out my workshop equipment to make things safer and faster. I never did trust those flimsy jacks the manufacturers give you, especially given the size and weight of Bert. So that was all fixed swiftly, and all that remains is for me to figure how to get the puncture repaired. Pointing at the large screw embedded in the tire should make things easier. But a much bigger problem occurred a couple of weeks ago. I was merrily using my PC, as I am now … I know, you can’t see me, but I am merry, trust me … when the PC pretty-much froze. A WTF moment. Then I noticed the disk light was on, and on, and on. Time for a reboot. Everything was fine for about five minutes, until, yes – the above happened again. And after the second reboot, the BIOS complained about a “media failure” – at which point, virtual rain stopped play. It’s at that moment that panic sets in and your whole backup and recovery plan flashes before your eyes. As I learned a long time ago, that’s really two things. Backup, and, Recovery. Actually, at one point in my IT career, I was supposed to be an expert in Computer Disaster and Recovery Planning. I wasn’t, but my boss didn’t know that, especially as he knew absolutely zilch about the subject. I knew enough that I can tell you 40% of large companies which have a disaster, but do not have a fully tested and working recovery plan, go out of business within a year. If it takes them more than two or three days to recover, their competitors happily fill the void, and it’s game over. Luckily, I’m not 40% of large companies. But, clearly I hadn’t remembered enough from those days, because even though I had backups, my disaster recovery plan was, well, a disaster. I have lots of drives, with backups spread around all that disk space. Really really essential, mission critical, I might as well be dead if I lose it stuff, I copy to Dropbox. I paid for 100GB, but for some reason they increased that to a whopping 1TB. Giggle Bytes and Terror Bytes as I call them. It’s all out there in The Cloud somewhere. I don’t care where. Not my problem to take care of it. But what about the other stuff? Anyhoo, job one was to restore Windows onto one of the good drives. “And where is my copy of Windows?” I wondered… “It’s on one of the good drives.” And how do I burn a DVD with Windows, when my PC no longer has a working Windows? Hmmm. Well, of course, I have CDs and DVDs, don’t I? Do I? Where the hell are they? Hours later, I conclude a box of DVDs must have gone missing in the move from Malaysia to Thailand. See what I mean about testing your recovery plan? I should have known that. Didn’t believe me did you? 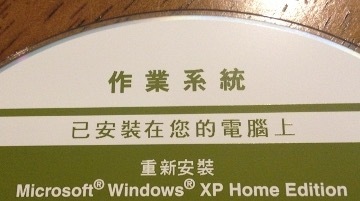 After many more hours, I finally found a Windows CD … that was all in Chinese! You’re kidding? Nope. I have no idea where it came from, or how it magically tucked itself at the back of a drawer that contains anything but CDs, but well, it was better than nothing. Challenging, but truly, better than nothing. The only way I could get it to load was to think “Now, what does Windows need to know at this point?” and then trying to guess which key to press. It took a day, but I got it loaded eventually. And then had to figure how to burn a CD! I am nowhere near back to normal. I’m still struggling to find drivers and license keys. In fact, I can’t remember what software I had, and am loading stuff as and when I need it… and at the same time discovering that a lot of the stuff I never really needed nor used. So. Think not about what your backups can do for you, but rather, what you can do for your recovery!